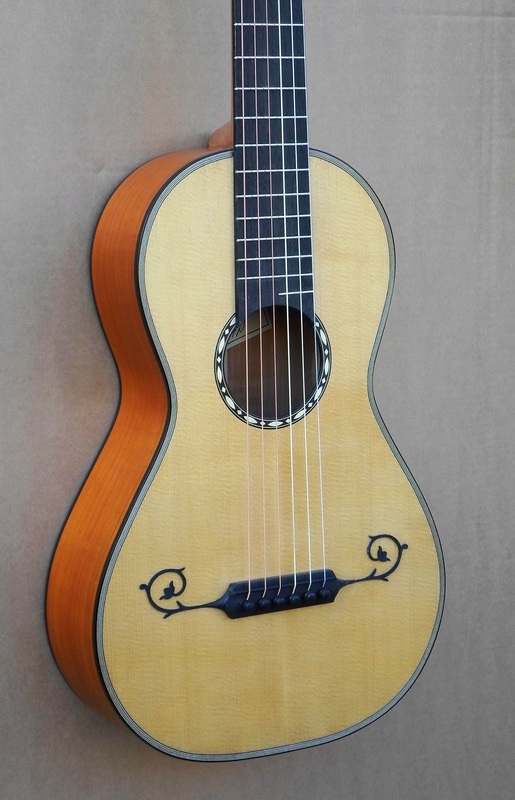 Romantic Guitar - after French 19 th century examples. An instrument designed very much in the style and manner of the early to mid 19 th century romantic guitars. Here I have taken aspects found on a number of original 19 th century examples and incorporated elements from various other period guitars into the whole design. This composition approach was certainly known to have been practiced by the historical makers of the time. We often find guitars that were made in Mirecourt or Paris constructed with stylistic features specifically aimed for the English market. 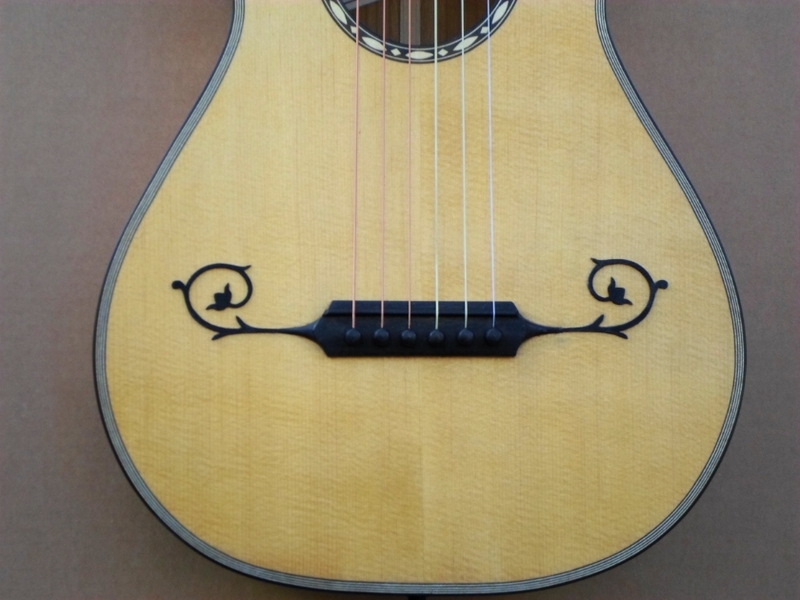 The basic body form is modelled on the Pons/early Lacote style with certain characteristics that are to be found on more typical French and English style instruments of the period. The decorative bridge harks back to earlier baroque and romantic guitars. 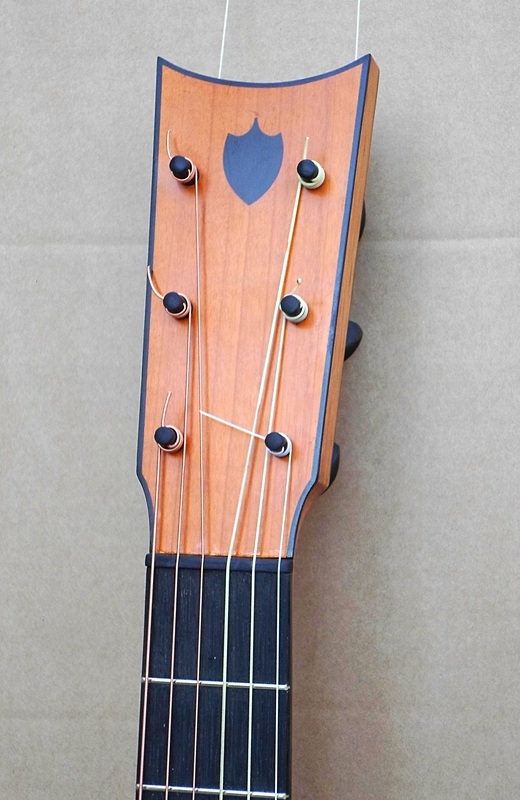 This has the typical ladder bracing and soundboard dimensions found on Lacote's instruments resulting in a clarity to the voices and almost a lute like brilliance to the trebles. 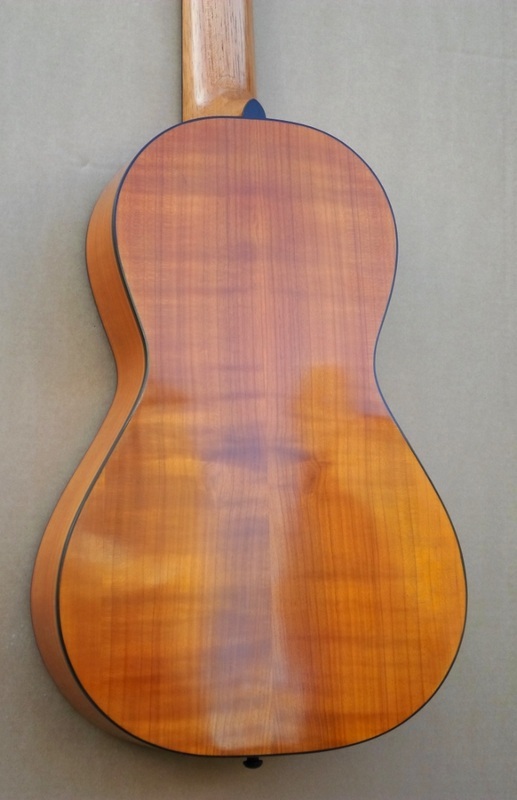 Such an instrument is obviously suited to the music of the period but we also increasingly find players using this type of guitar for Bach and other baroque composers. * Can also be constructed as a 5 fan braced model, more reminiscent of the Louis Panormo with it's fan braced flat soundboard construction. It's tonality then tends to fall somewhere between the French Lacote style and the more rounded mellower tone of the fan braced small Torres. Back: Figured maple or English walnut. Decorative bridge, bound head, head inlaid with historical shield design. Rene Lacote diagonal and scalloped period ladder bracing. Nut width: 48 or 50 mm.